Depending on the age of your blog, you may have engaged in some questionable (or even black hat) SEO at one time or another, including link exchanges. 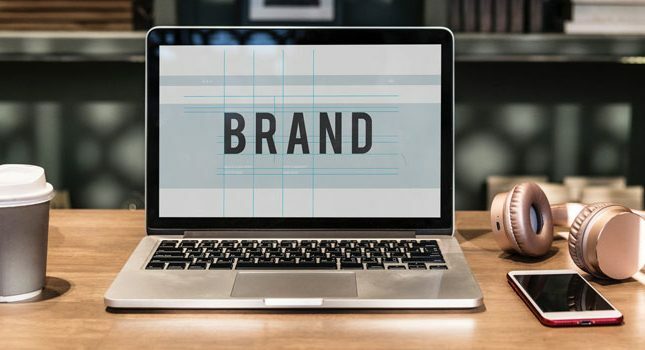 Over the past few years, reciprocal links, link farms and even overly optimized anchor texts have all come under Google’s scrutiny and resulted in demoted placement of the offending site on the search engine results page (SERP). This spring, you may wish to clean up the links on your website or blog. However, you might also intimidated by where and how to start. How can you quickly spring clean your site of its offending links? Here are 10 steps. 1. Start with Google’s Webmaster Tools. This API from Google provides you with a wealth of information about your website including its search queries, inbound links, user traffic and duration, etc. If you don’t yet have your website registered with Google Webmaster Tools, you can get started by generating a sitemap of your site and then following the API directions. Not sure how to generate a sitemap? In WordPress, there are many plug-ins that you can download that will generate a site map for your site on request. For other platform-based websites, you can try an online sitemap generator. 2. Check for an unnatural links warning. 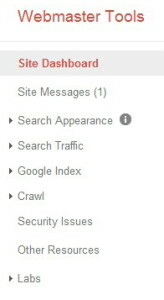 In the left-hand panel of your Webmasters Tools dashboard, you can instantly check if there are any messages from Google in the ‘Site Messages’ area. This is also where you may have an unnatural links warning waiting for you. If you do get such a warning, be grateful. It means that Google is willing to work with you to get your site re-indexed on the SERP. 3. Check for a manual action. In many cases, and especially if it’s been a while since you last logged into your Webmaster Tools area, your site may also have undergone a manual action (i.e., penalty). This action should be read and carefully scrutinized because the penalty describes in better detail exactly what content Google has removed from its index. For example, in some cases, one of your site’s guest posts and not your entire website may have been removed from the index due to a spammy link. This is much more easily fixed than if your entire site was penalized. 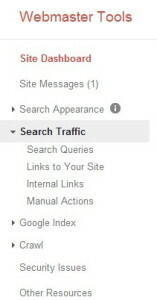 Manual actions are located in the dashboard area under ‘Search Traffic.’ The manual actions area also contains a button that enables you to request a review of your website once it is all cleaned up. 4. Perform an inbound link audit. This will open up a list of websites that link to your blog. Research these sites, especially those sites that link multiple times to your blog. There is the chance that such sites might be completely unrelated to your website or just plain spam. The site is relatively new. The site has a low Page Rank. The link originates from the general site, not a particular page. The linking site has many unrelated or spam links of its own. Clicking on the link triggers a malware/spyware warning. There may also be completely legitimate sites that link to your site but use over-optimized anchor text like ‘cheap hotels’ or ‘fast weight loss.’ Compile a list of these sites, along with the unrelated or spam sites. 5. Contact the site link owners. Now comes the fun and rather tedious part: contacting the owners of the websites and blogs where from your inbound links originate. Depending on how many inbound links you need to address, you may wish to either do this task yourself or outsource it through Fiverr or oDesk. You can request that your link be either completely removed or a rel=”nofollow” attribute be added ahead of the link going to your website. In most cases, if you phrase your request politely, webmasters and bloggers will comply with your wishes. Regarding the sites that are legitimate but contain over-optimized anchor text, you may wish to work with the website owner and change your text. You need not make your anchor text completely random (e.g., ‘click here’); adding diverse anchor text terms (e.g., synonyms) that have some relationship to your original keywords is fine too. Keep in mind that Google’s algorithm keeps track of patterns rather than actual terms. As long as you can divvy up your anchor text to not repeat ‘cheap hotels’ or ‘fast weight loss’ 50 times, you’ll be OK.
6. Use the disavow links tool. What can you do if you find an excessive amount of spammy backlinks and/or can’t reach the webmaster or blogger who linked to your site? 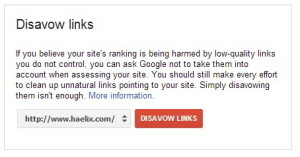 When all other options fail, Google has a last-ditch effort tool called the disavow links tool. Using this tool, you can add specific pages or even entire websites and ask Google bots to not crawl them. Keep in mind that the spam links will still show up in the ‘Links to Your Site’ area. 7. Perform an outbound link audit. Unnatural outbound links can also hurt the placement of your blog on the SERPs and even result in a manual spam penalty being applied to your account. This can easily occur if you have the CommentLuv plug-in on your blog, for example, resulting in every comment getting a link back, including spam comments. Outbound links may also become a problem if you have ever accepted guest blog posts and allowed the author to insert a link, especially an over-optimized anchor text link. There are many useful online tools for finding and listing outbound links on your website. My personal favorite is semrush’s Site Audit. 8. Remove suspicious outbound links. How can you remove spammy outbound links? 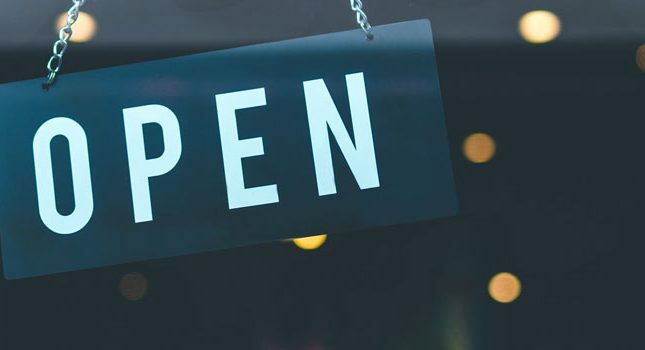 There are many WordPress-based plug-ins like the Nofollow for external link, which adds an instant nofollow tag to every outbound link on your site. Other great “unlink” plugins include Broken Link Checker, which finds links that don’t go anywhere, Wordfence Security, which scans regularly for malware trigger links, and CommentLuv Link Cleaner, which removes outbound links on comments. Non-Wordpress-based websites can be analyzed using Majestic SEO, a popular analysis tool that lists links and their associated anchor text. 9. Decide which links will be canonical. One of the biggest sources of SEO loss is duplicate content- or rather, what Google perceives to be duplicate content. This occurs via links that lead to pages containing the same content. For example, many webmasters have both http://website.com and http://www.website.com versions of their websites. To Google, this means that there is duplicate content of that web page. The same designation should be inserted into the <head> areas of your “noncanonical” pages as well. 10. Submit your site to Google for reconsideration. 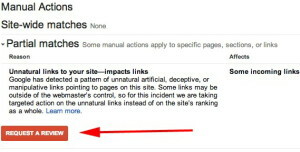 Once you are finished removing bad links from your site and otherwise tidying it up, you can submit your site for reconsideration by Google in the ‘Manual Actions’ area (see image in step 3). Click on ‘Request a Review’ and be sure to write down the list of improvements you’ve made to your site since the penalty came into play. If you’ve have made a sufficient good faith effort to un-spam your links and site, Google may revoke the penalty. Good luck! Do you have a Google penalty story? Has your website or blog been penalized by Google? If so, how did you ‘kiss and make up’ with Google? Tell your story in the comments below.